June 2013 is going to be one of the big month for video-game industry as numerous high profile multi-platform and exclusive games are coming for numerous gaming systems. Here is the list of Must Buy Games in June 2013. All you superheroes video-game fans out there, something special is there for you in June 2013. Neo-Paris, 2084: Personal memories can now be digitized, bought, sold and traded. The last remnants of privacy and intimacy have been swept away in what appears to be a logical progression of the explosive growth of social networks at the beginning of the 21st century. The citizens themselves have accepted this surveillance society in exchange for the comfort only smart technology can provide. This memory economy gives immense power over society to just a handful of people. A visionary 3rd person action adventure, Remember Me puts players into the role of Nilin, a former elite memory hunter with the ability to break into people's minds and steal or even alter their memories. The authorities, fearful of her knowledge and capabilities have arrested Nilin and wiped her memory clean. After her escape from prison, Nilin sets out on a mission to recover her identity, helped by her last and only friend. This search for her past leads to her being hunted by the very people that created this surveillance society. Marvel Heroes is the massively multiplayer online game where you get to play as your favorite Marvel Comics super-heroes! Stop criminals in their tracks with Spider-Man's web shooters. Sling Captain America's famous shield into a horde of HYDRA goons. Unleash the lightning of Storm against the anti-mutant Purifiers. Or play fan favorites like Cable, Deadpool, Ms. Marvel, or dozens of others. In this free-to-play game, you get to experience a world-spanning storyline written by Brian Michael Bendis featuring iconic locations and classic scenes drawn from the history of Marvel Comics. 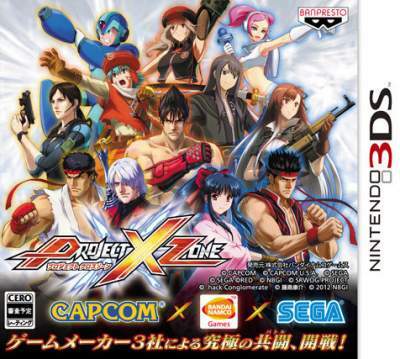 Three of the industry's biggest Japanese developers team up to create Project x Zone, an RPG/Strategy game featuring characters of games from all three publishing labels.